Registration for MESC 2019 is Now Open! Your registration fee provides you with admission to all conference sessions and conference sponsored events. Your registration fee also provides each attendee with meals (Monday-lunch & breaks; Tuesday & Wednesday-breakfast, morning/afternoon breaks & lunch; Thursday-breakfast & morning breaks), the Sponsor Opening Reception and the Poster Session Reception. 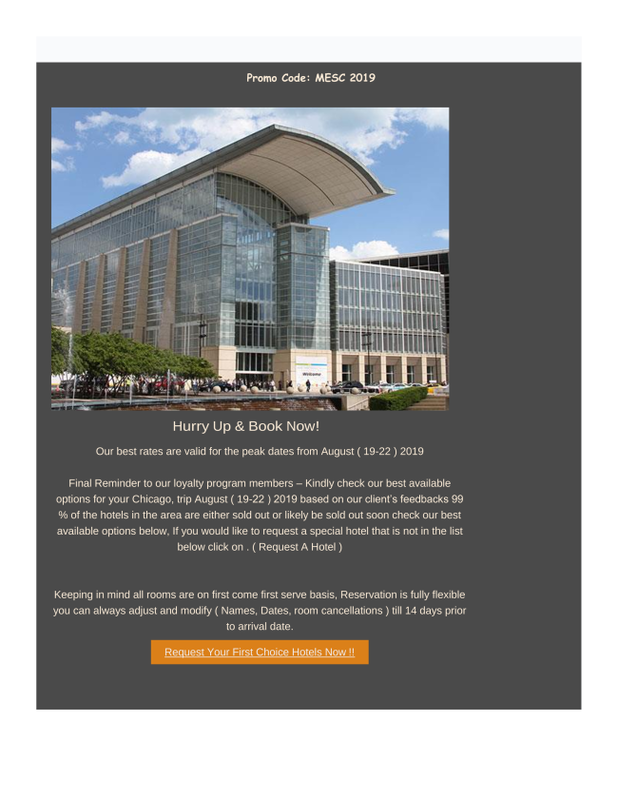 MESC 2019 has secured blocks of rooms at two hotels, the Marriott Marquis and the Hyatt Regency, both within close proximity of the McCormick Center. Note, we have not contracted with any agency to serve as a sponsor housing service. These organizations (aka – hotel pirates) may collect your information for fraudulent purposes. Please use the information above to secure your room. The government room block at the contracted hotels are reserved for government employees only. All individuals who have reserved a room in the government block will be required to present government employee identification. Please be advised that if you attempt to secure a government room without the appropriate credentials the hotels will not honor the room request and you will be turned away. Please take this advisory notice seriously and secure the appropriate room. Please be aware that a hotel booking agency not affiliated with the MESC is promoting their affiliation with MESC 2019 and seeking to secure your reservations. Their claim that 99% of the rooms are sold out is incorrect as we have secured a sufficient number of hotel rooms for our attendees. We strongly encourage you to use the hotel reservation links provided on our website to secure reservations at the MESC 2019 host hotels, the Marriott Marquis and the Hyatt Regency, to be included within our group. A graphic from their message is included below so that you will be able to identify this SPAM message. We are please to announce that the MESC 2019 Day at a Glance schedule is now available. You can view the Day at a Glance schedule here. You can also download a PDF of the MESC 2019 Day at a Glance here. When posting about MESC 2018, please include the #MESC2018 hashtag.